The stretch of land between Harrington Sound and Castle Harbour is riddled with caves. 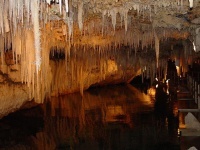 Located 80 feet (24m) underground, Crystal Caves never ceases to amaze with its dramatic stalactites and stalagmites. There is a wonderful walk over the pontoon bridge to Cahow Lake, with crystal-clear water that reaches a depth of 55 feet (17m). Visitors can also enjoy a leisurely stroll through the Palm Garden. A little further on are the Leamington Caves with their incredible crystal formations and underground pools that can be explored along well-marked paths. More caves are located on the grounds of the 300-year-old Walsingham House, now a well-known restaurant.